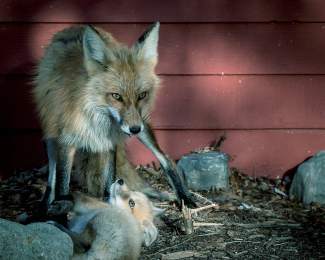 Adult foxes and their pups have begun to emerge throughout Summit County this spring. JASPER, Alberta – Spring skiing poses different challenges along the spine of the Rocky Mountains. In Vail, the threat of lightning chased off skiers on the last weekend of skiing in April. In Alberta, though, grizzly bears pose a particular challenge. 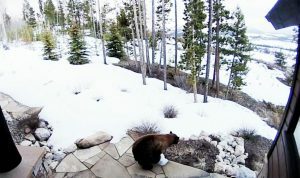 The grizzly bear that showed up on the closing weekend at Marmot Basin was “shooed away,” in the words of a spokesman for Jasper National Park. Three hours to the south, at Lake Louise, which is within Banff National Park, a 10-year-old sow known by the local ski staff as “Olivia” emerged to browse greenery on the front side of the mountain that has emerged during the last month of exceptional warmth. The Rocky Mountain Outlook reports that skiers were understanding about the need to be shunted to the back side of the mountain to terrain accessible only by gondola. CANMORE, Alberta – A documentary filmmaker named Leanne Allison thinks that the Canmore-Banff-Lake Louise communities have a story to tell about living with wildlife that other places — pointedly those in British Columbia — should hear. Allison says these Bow River Valley communities are “world leaders and innovators” in the past 20 years in forging coexistence between human and grizzly bears and other wildlife. “People outside don’t realize how advanced we are here and (with) the cultural attitude toward living with wildlife,” she tells the Rocky Mountain Outlook. 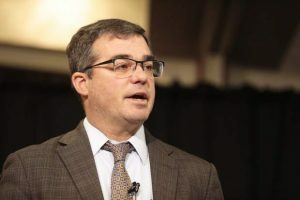 Allison cited the Bow Valley’s bear-proof garbage bins, the creation of wildlife corridors, and some of the world’s first highway wildlife fencing and overpasses. BEND, Ore. – The big keep getting bigger. In the Cascade Range of Oregon, Mt. Bachelor has announced plans to build a $6 million Doppelmayr high-speed detachable lift to serve 635 new acres of terrain. This addition will give Bachelor 4,318 acres, making it the sixth largest ski area by land mass in North America. Liftopia puts Whistler Blackcomb at No. 1 at 8,1717 acres followed by Park City Mountain Resort & Canyons at 7,300 acres, Big Sky at 5,800 acres, Vail at 5,289 acres and Heavenly Mountain at 4,800 acres. With this expansion, Bachelor will move ahead of Sun Peaks and Lake Louise. SALT LAKE CITY, Utah – Alta is an anomaly in this way: It calls itself a ski area, not a resort. And to improve the skiing experience, the ski area at the top of Little Cottonwood Canyon has plans for several new lifts, including a high-speed detachable quad, plus a tram that will, if approved by the U.S. Forest Service, reach nearly the summit of Mount Baldy. The ski area says the primary purpose of the tram will be to aid ski patrollers when doing avalanche control work. By getting to the top, they can throw hand charges into the snow-laden slopes below instead of using howitzers fired from below to trigger avalanches. One reason for the shift, says Connie Marshall, Alta spokesman, is that the U.S. Army at some point intends to phase out giving mortar shells to ski areas for avalanche control. Part of this shift has been provoked by concerns about homeland security. But since the tram to the top of 11,068-foot Baldy will be in place, it will also become available to skiers when conditions allow, says Alta. The tram is to have an hourly capacity of 150 passengers. In reporting these facts, the Sale Lake Tribune thought it pertinent to also talk with conservation groups. Carl Fisher, of Save Our Canyons, said it was almost sacrilegious to provide people mechanical access to the top of Mount Baldy. “The hike to Baldy has been a rite of passage for a lot of folks,” he said. DURANGO, Colo. – It was a good year for snow in the San Juan Mountains of Colorado. It was also a good year for ski areas. Purgatory Resort, located between Durango and Silverton, reported a 17-year high for skier visits, the result of good snow, a new high-speed lift, and a 50th anniversary celebration. 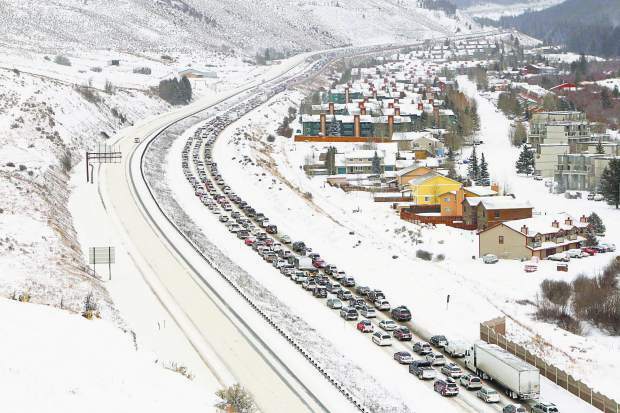 At Wolf Creek, located between Durango and Alamosa, snowfall had reached 400 inches by late April, with more still falling, compared to 270 inches all of last season, reports the Durango Herald. While that’s a lot of snow, keep in mind that in California, Squaw Valley got 600 inches in just season a few years ago, before the drought. 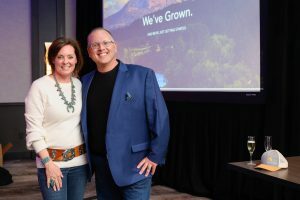 VAIL, Colo. – Too much racket to hear yourself think? Don’t go to Vail for relief. There’s an interstate highway that roars through town. But don’t go to the Everglades, either. Where there’s water, there tends to be noise. Ditto trees and other vegetation, when the wind blows. Instead, go to Nevada, which has little water, little vegetation and few people, making it the quietest of states, according to research by the National Park Service study, followed by Wyoming. But Utah’s slickrock country also ranks among the quietest places on Earth, points out the Vail Daily. JACKSON, Wyo. – Teton County, which is more or less synonymous with Jackson Hole, voted for Barry Goldwater in 1964. And while it has much in common with liberal enclaves like Telluride and Aspen, it still tilts Republican, as Wyoming does decidedly so. Statewide, 69 percent of all voters in Wyoming are Republican. But Democrats have been gaining in Teton County, reports columnist Jonathan Schechter in the Jackson Hole News&Guide. As recently as 2004, he reports, 57 percent of local registered voters were Republican, while just 20 percent were Democrats. The balance were unaffiliated. But beginning in 2008, Teton County began shifting. Now, Republicans are down to 45 percent and Democrats are up to 35 percent. JACKSON, Wyo. – This is the 100th anniversary of the National Park Service in the United States. There are 411 sites, ranging from Yellowstone, the very first, to any number of Civil War battlefields and other such sites. To mark the anniversary, the U.S. Postal Service chose 16 national parks to be remembered in commemorative stamps. But Grand Teton, the backdrop for Jackson Hole, did not make the cut — at least not directly. The Jackson Hole News&Guide explains that an image of the Tetons was used for a stamp honoring the Marsh-Billings-Rockefeller National Historic Park in Vermont. But then, does anybody (other than this writer) buy commemorative stamps any more? Should Andy Wirth use the words of John Muir? TRUCKEE, Calif. – Andy Wirth does not lend himself to a stick figure of a real estate developer. He’s a rock climber and may continue to be a skydiver. He once was a wilderness ranger. In his office at Squaw Valley, where he is chief executive, Wirth also has quotes of John Muir, the apostle of wilderness. That’s not out of character when you consider that his grandfather Conrad Wirth was the longest-serving director of the National Park Service. Moreover, his great-grandfather Theodore Wirth helped design the Minneapolis park system and was a leading figure in the country’s urban park movement. But earlier this year, the Sierra Club accused Wirth of going too far when he cited Muir, the founder of the Sierra Club, in the resort’s in-house magazine. Bruce Hamilton, deputy executive director of the Sierra Club, was not pleased. “You invoke the legacy of John Muir as you pursue destruction of his beloved Sierra, and we are asking you to stop,” he wrote in an e-mail to Wirth earlier this year. What destruction does Wirth pursue? Working on behalf of KSL Capital Partners, the Denver-based firm that owns Squaw and its sister resort, Alpine Meadows, Wirth has been arguing for a major real estate construction at the base. Squaw says it needs 850 more lodging units to create a true, year-round resort. This is to include 1,493 bedrooms, and 206,211 more square feet of commercial space. Opponents say it’s entirely too much. The Sacramento Bee, in a meaty story about Wirth and the real-estate controversy, also quotes Tom Mooers, of Sierra Watch, who accuses the 51-year-old Wirth of “green-washing.” That’s defined by the Bee as using environmentalism to promote development. “Squaw is an appropriate place for some development, but KSL has come in with something that is so out of character with the Tahoe area,” Mooers told the Bee. Sierra Watch also objects to the gondola that Squaw proposes to build next to the Granite Chief Wilderness, linking the two side-by-side resorts. Wirth tells the Bee that he understands the resistance. Having spent half of his adult life in Steamboat Springs, Colorado, where he worked for ski area operator Intrawest, he saw how fiercely residents want to protect mountain towns. However, the rhetoric surrounding the development plan does not match the reality. For one thing, almost all of the development would happen on what is now an asphalt parking lot, not on undeveloped land. “To create a four-season resort with a supporting bed base, the village needs ‘critical mass,” Chevis Hosea, vice president of development for Squaw Valley Ski Holding and Squaw Valley Real Estate, told the Sierra Sun. Opponents had first tried to incorporate the base area, in the belief they could gain greater control. With a substantial advantage in marketing, KSL managed to defeat that proposal. Instead, the real estate and other proposals will get heard by planning commissioners in Placer County. As for Wirth’s skydiving, it nearly cost him his life three years ago when he almost lost his arm and nearly bled to death after crashing into a vineyard south of Sacramento. A trained medic, he was able to apply a tourniquet to prevent himself from bleeding to death. He now has full use of his arm again and he has not ruled out skydiving once again. “I just don’t know if I’m done yet,” he said. “It’s the most intense, fun and exhilarating feeling I have ever had,” he told the Bee.